Great news is coming from Osp, more specific from Mišja peč. 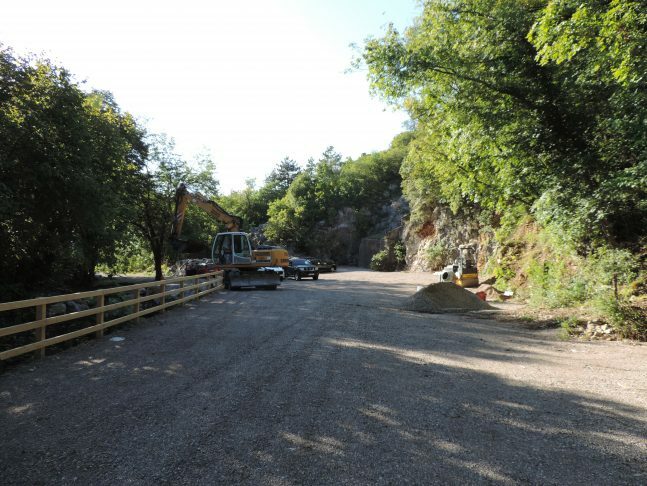 After many years of struggling, changing the parking places, problems with the landowners, the climbers are getting a new modern parking place for about 50 cars just under the wall of Mišja peč. This is the same place where it used to be the first Mišja pečs parking place many years ago. Finally, the landowners, the Osp community, city of Koper with providing different documentations, project LIKE by financing, PZS (Slovene mountaineering organisation) and Slovene climbers united in Projekt O.S.P. joined their forces and found a new nice solution where to park the cars, not disturb the locals, walk on their private land and so on. Let’s hope this will work! Considering climbing news, this weekend with lots of rain and strong NE wind the temps finally fell down and after this long summer heat created nice conditions for climbing. Vera Gussetti smashed her second 8b, Masochismo in Baratro, then Guido De Sabbata clipped the chains of Il musico (8b+), also in Baratro. Passing Slovenian border, a week ago or so Mitja Jereb ticked also his second 8b, the famous Sežana 31249 in secret cave of Skedenj close to Sežana. In Skedenj, please be really careful, as we have heard that the old psycho with two dangerous dogs is walking around there, molesting the climbers. He was already taken and charged by the authorities once or twice, but looks like it didn’t calm him down. In Croatia, in Buzetski kanjon, Jakob Šprah redpointed the bouldery Vaška mafija (8b) on his second go and onsighted Šefka (8a), which might be the first onsight of this tricky roof. On the other side of Buzetski kanjon, on the far right of the sector Đoser, Goran Matika – Gogo bolted a new hard project as he has already climbed all the routes in this magnificent canyon. Well done, guys and girls! The climbing season is on and we are ready!